Initially i went out for the day fishing, blanked. Streamered and nymph. Never saw a rise. Found a guy with a hook in his ear however. At least i unhooked something that day. It was 3 days after the rain so the river had washed off nicely but all was quiet. Only thing i saw jump was a minnow. Nothing there took a streamer. It was Emilys turn now and she missed a couple of takes before foul hooking a chub, it was a bloody big thing but it soon came off leaving a 5p size scale on the barbless nymph. She then caught a smaller one of the trio sat in the shallows but after a short fight it shook itself off and Emily was determined for another. Siting a shoal of roach i told her to cast towards the reeds, roach are bloody ignorant fish at times and then, focused on the roach looking at the nymph, a fish fired out of the reeds and hit the nymph. We both sort of jumped and i soon realised it was a pike that had took the nymph. Whether its initial intention was a roach i wouldn't know as it was hooked in the top lip like a normal take would be. Emily held her fish well, i never the mentioned teeth, she was fond of it's bright blue cheek and she happily released it too. Unfortunately in her celebration she grabbed a bramble tightly so that it made her hand bleed. After a couple of tears and a little word about plants, again. She was back happily fishing. We didn't stay too long after that, we had to get the bus home and we had accomplished our goal for the day. A week later, 2 days after a rise in river levels, I met up with Graeme to fish an urban stream spotted on google maps. Within half hour we had 4 trout and a minnow between us, well i had one trout, i won't steal Graemes glory. It is a tactic we use fishing new water and at the start of the day. One sets up on nymph the other on streamer. Graeme scouts the pool with a nymph then i follow with a streamer. 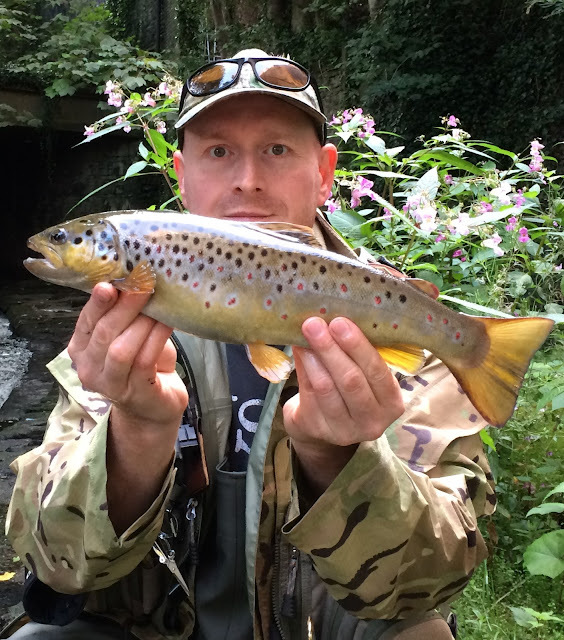 Catching a trout on each method in the same pool proves that it doesn't put off the fish chasing streamers if they don't want the nymph. Unfortunately this stretch wasn't too long due to accessibility so we headed to another river we had fished once or twice before. 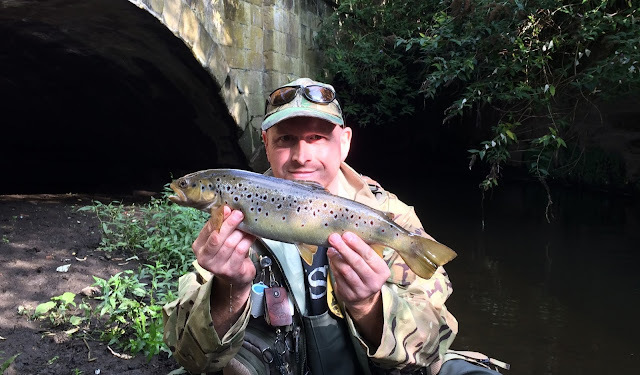 After missing an attempt of 2 trout who were too busy chasing each other, it went quiet for a very long time, we spooked one decent fish but there was no life showing. Surprisingly it was the lowest i have seen this river despite the rain and the fact i had fished this river before in the hottest times of summer. It was like it was leaking out somewhere! I missed a take which we was unsure of being a trout until it hammered something on the surface 5 minutes later but the fishing proved difficult and we was left wondering what the problem was. Plant life made casting difficult and though we didn't lose flies we had to rerig alot of times because of snags. Graeme did manage one himself, a lovely little fish that will be a cracker when it's older. In the end we were left a little perplexed about the way the day ended, luckily fishing as a pair we made the most of it and had a good laugh but a few more fish lost never mind caught would of rounded the day off nicely. With a new urban river to fish before the season closes i can only hope for a change in fortune or need i look at myself and look what i'm doing wrong.